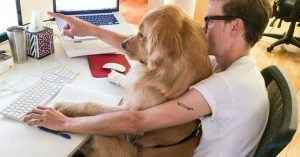 A celebration of the companionship between canine and human, National Take Your Dog to Work Day hopes to inspire others to adopt from shelters and humane societies. If you are considering a move to Cheyenne, know that this is a dog-friendly town. I think you would be hard-pressed to find even one street that does not have at least one home where a dog owns their own family. There are even several places where you can obtain a friendly canine who would lovingly adopt you and your family. This includes the Cheyenne Animal Shelter and several rescue groups for a variety of different loveable balls of fluff. However, whether you are moving here for the first time, or looking to purchase your first home, or just moving up the property ladder with a different property, it is important that you be prepared for the stress of them accepting a new home with a new fence and way too many smells to get used to – at least in the first few hours. While not everybody is able to take their dog to work, they do brighten the day when we get home. Some people are even able to work from home and that makes Fido even happier. Our pets do bring a sense of happiness to our lives. They are there to let you pet them when you have a down day. Personally, I love animals and dogs are my favorite. When I look at a home with pet lovers, I try to point out the amenities that your favorite fluff ball might like as well. Call me today and let us help you find the right home at 307-286-0396.